With one of the largest selections of fine cigars in America, Happy Harry’s offers a range of products to satisfy the casual smoker or the connoisseur with the most discriminating taste — all carefully preserved and presented with style in our walk-in humidors. Wondering where to start? We’ve compiled a Cigar Guide for you to select that perfect cigar. It all comes down to the three S’s: size, shade, and shape. 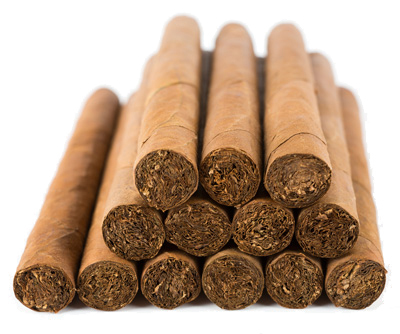 If you would like to learn more about all things cigar visit our Cigar Guide. A humidor is a specially designed box for holding cigars. It is most often made of Spanish cedar and contains a hygrometer to maintain a constant humidity. A constant and proper humidity is essential to keep cigars from drying out or from being too moist and developing mold. A consistent temperature of 68⁰F -70⁰F and a relative humidity of 70-72% keep your smokes in perfect shape. Proper storage at the appropriate humidity and temperature is the most critical factor in maintaining the quality of cigars. The cape or the head of handmade cigar must be cut before lighting it. You can do this with a cigar scissor, guillotine cutter or a punch cutter. The guillotine is recommended for the most effective cut. Make sure not to cut the entire cap off, because this could damage the wrapper. Lighting the cigar is an art that will enhance the enjoyment. By using a slow, two-step process you can ensure that one side of the cigar will not burn faster than the other side. Step one: Hold the cigar horizontally and rotate it in the flame to evenly warm the end. Step two: Put the cigar in your mouth. Keeping it still in a horizontal position, hold the flame only to the tip of the cigar, and draw slowly as you continue to rotate.